There are many different types of awnings available. To give you an overview on the different types and where and when to use them in the most efficient way we’ve created this roundup for you. The retractable awning is the most basic option. You’ve probably seen many of these kinds of shades. 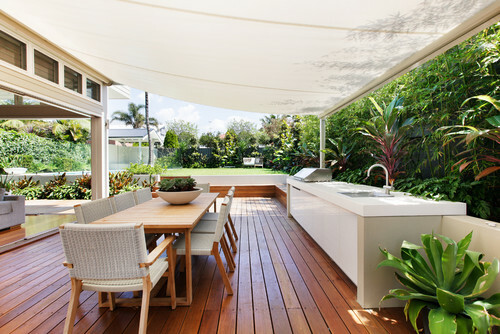 On the plus side, retractable awnings do exactly what you want them to do – they provide shade and (up to a point) cover from a light shower for your outdoor seating. And when you’d rather sit in the sun, they allow for that as well. Their disadvantage? They usually are not that sturdy in face of inclement weather and wind, and you have to retract them manually. Which can be rather problematic, particularly when you’ve let the awning out over night and a strom approaches. 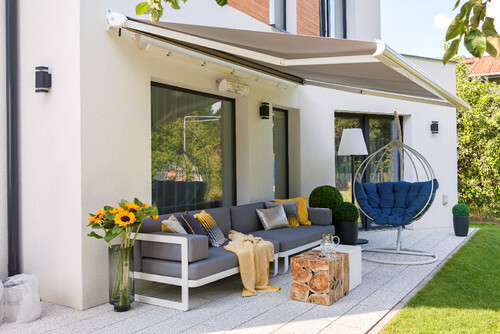 As the most cost-friendly option, retractable awnings are a good choice for everyone who just wants a little shade every now and then and doesn’t mind the manual aspect. Basically motorized awnings are just the same as their more basic counterpart, the retractable awning. They provide shade when you need it, withstand a little light rain, and can be easily retracted when you feel like getting a bit of sun. Just as mentioned above, motorized awnings usually are not the most sturdy contraptions and generally do not withstand bad weather easily. However, many motorized awnings these days come with sensors that will automatically retract your awning once a certain wind force is reached in order to protect them from tears. If you do not want to worry about wind or storms at night or while your out and about, motorized awnings are your best choice. 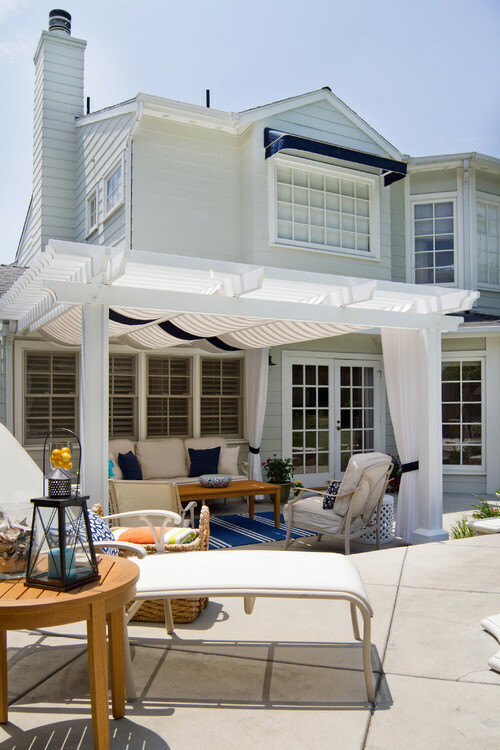 Stationary, or fixed, awnings are your best bet when you want to permanently shade a portion of your home. More often than not they come with fixed support poles for additional stability, and are therefore generally more sturdy and able to withstand bad weather than retractable awnings. Since stationary awnings are a permanent extension to your living space, one of their biggest advantages is the fact that many companies will design them specifically tailored to your individual needs, thus allowing for shading of non-rectangular spaces, which usually is a challenge for retractable awnings. Portable awnings come in many forms. The most usual are sun umbrellas, which in turn come in many different variants. From the classic umbrella we all know to elaborate constructions that allow for a “floating” look, there’s a plethora of options to chose from. Another more and more popular option, particularly for pool shading, are canvas canopies that look remarkable like sails and instantly give your outdoor spaces a mediterranen look and feel. 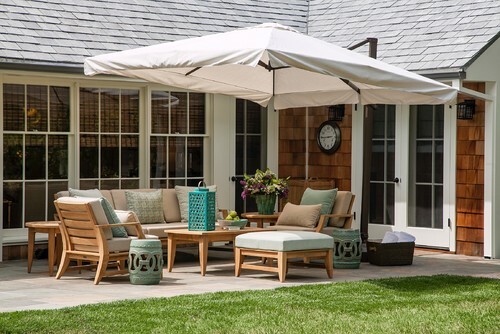 Portable awnings in general are a wonderful option if you’re not looking for a permanent solution, or need shading that allows for being moved around freely and easily.